“Hooning” the Young People call it, I believe. Ey, when I were a lad, it were all fields around ‘ere and, what’s more, I’d hop on my BMX, push it to the top of the steepest hill I could find and go hooning down it with wild abandon and total disregard for my own safety. As I recall, I never wore a helmet and never hurt myself. Now I’m a grumpy old man, I have to put quite a bit more thought into it before I go hooning anywhere. After all, I did once manage to break my collarbone when I rode head first into a gigantic steel post that’d been there forever. Another time, I inexplicably woke up on my back in a ditch, my bike up in the air still clipped onto my shoes, my ribs broken and my so-called-friend half laughing, half worried about me back up on the road. 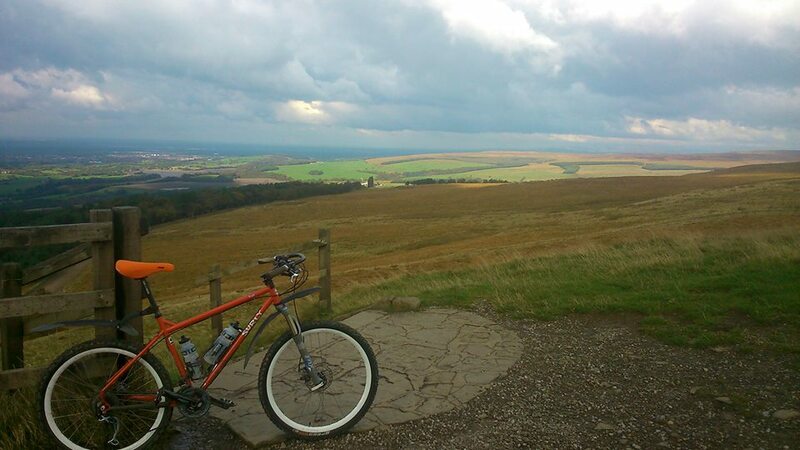 As I reported on Monday, this week’s escape from the office was clearly earmarked for non-stop mountain biking. Of course, as is the way with such things, I ended up wasting spending 2 precious days doing work stuff and another day doing chores (there’s only so much anyone can get away with, I guess). 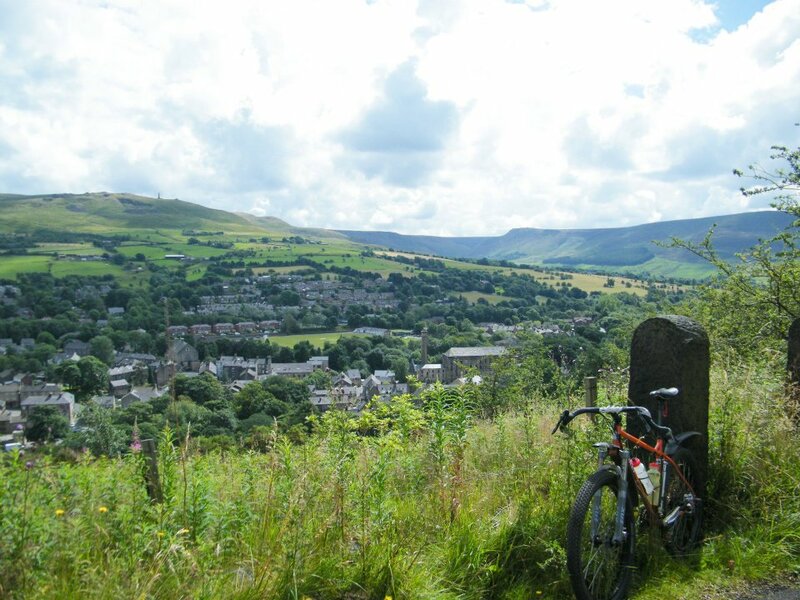 I did manage to squeeze in a trip to the bike shop and a few miles exploring the local lanes but the excitement all happened in t’ hills around t’ Chorley about 20 miles north of t’ Manchester. Monday was really a bit of a shakedown. My Surly Troll was devoid of its usual rigid fork, racks, luggage & road tyres and instead was sporting a Fox F100 suspension fork, 26×2.1″ Continental Speed King tyres and, well, not a lot else. 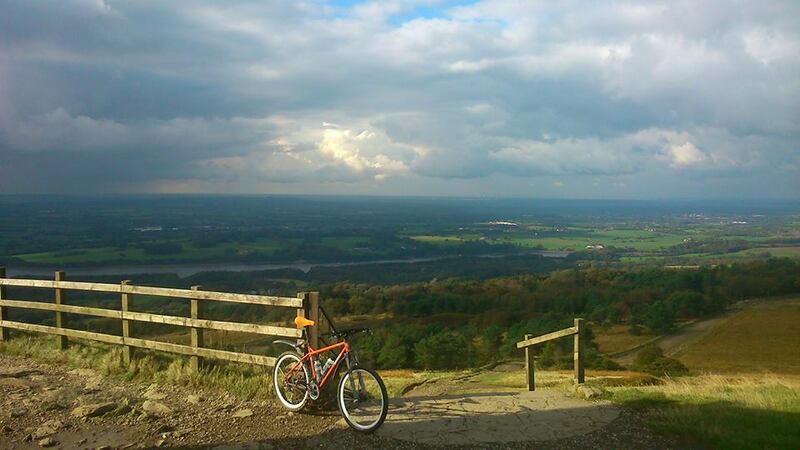 After abandoning the car somewhere in deepest, darkest Rivington, I basically spent a couple of hours getting well and truly lost, fiddling with the adjustable fork, trying to sort out the shifting issues I was having and dusting off my extremely rusty mountain biking skills. The majority of my day was spent climbing, climbing, climbing so there was sadly no hooning to be done until right at the end of the ride. The scenery was pretty spectacular though. When it finally came time to find my way back down to the car (it was somewhere down there by the reservoir), it seemed the perfect opportunity to give my new Jeff Jones Loop handlebars their first proper off-road test. 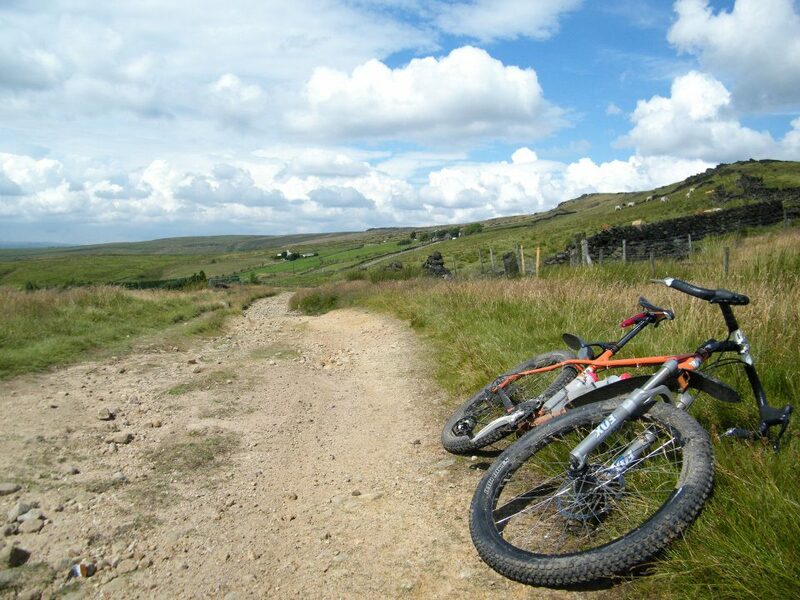 You can check out the various hand positions they offer and the eye-watering price tags on the excellent Jeff Jones Bikes website. Pointing the front wheel down the hill, I shifted my hands to the very outside of the bars, one finger on each brake lever (the rest firmly wrapped around the grips) and unleashed my inner BMX riding child. I shudder to think what speed I was going at but it certainly wasn’t the “safe and controlled pace” recommended in the brochure. The fork was doing everything it could to absorb the massive impact from each of the equally massive rocks it hit, my water bottles threatened to rattle loose from their cages and as I neared the bottom of the descent, I wondered whether my brakes were going to stop me in time. The front wheel hit a particularly large rock and as I gazed down at the approaching trail, I wondered just how the ambulance would reach me. Happily, with all the extra stability and leverage the bars gave me, I stayed upright and the Troll just wanted to go faster. Moments later the front wheel dropped into a rut, caught the sides and again I was wondering how I’d look after facial reconstructive surgery. The only thing you can do in that situation is let go of the brakes, get your weight back over the rear wheel, close your eyes and hope. “FASTER, FASTER, FASTER!! !” the Troll kept screaming and somehow we made it to the bottom in one piece. I’d never been so happy to see a Vauxhall in all my life. Friday morning, I was a determined man. I woke up and ate the contents of my fridge. I packed a bag with a couple of bananas, some malt loaf and a lump of Kendal Mint Cake. 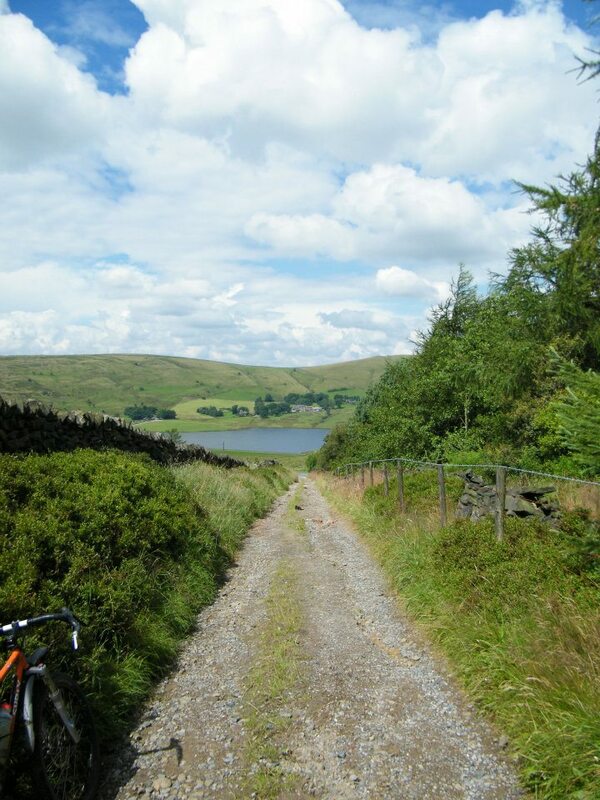 I grabbed a MUCH better map and set off to ride the curiously named Anglezarke Loop. All of it, this time. I made the decision to swap out the 26×2.1″ Contis for the only bigger tyres I had lying around the garage: a 26×2.4″ Maxxis Holy Roller for the rear and a 26×2.4″ DMR Moto RT for the front. Not exactly off road tyres but I was guaranteed good drive and sticky rubber on the rear and at least some directional knobblies to help keep the front going where I pointed it. 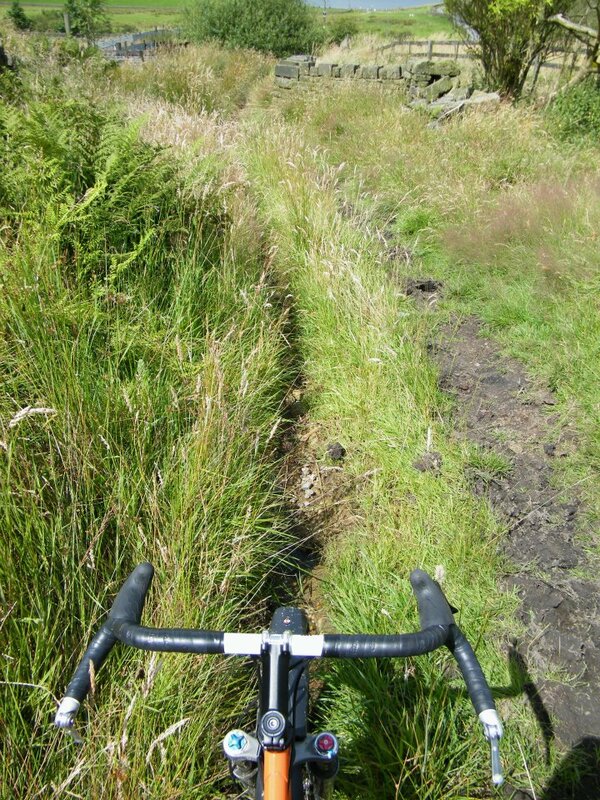 For reasons that escape me, I decided to ignore the “mountain bikers may find it easier to ride the route in an anti-clockwise direction” advice, parked at Anglezarke Reservoir and set off in a decidedly clockwise direction. On the short road section, I was instantly glad of my tyre choice as, despite the increased volume, I had considerably less rolling resistance. As I hit the trails and unlocked the suspension, traction on the wet, slippery rocks was spectacular but in the deep, squelchy mud, it got a little skittery. Before long, the anti-clockwise advisory became clear. Heading this way, it’s uphill for what? 70 – 80% of the ride. At least that’s how it felt. 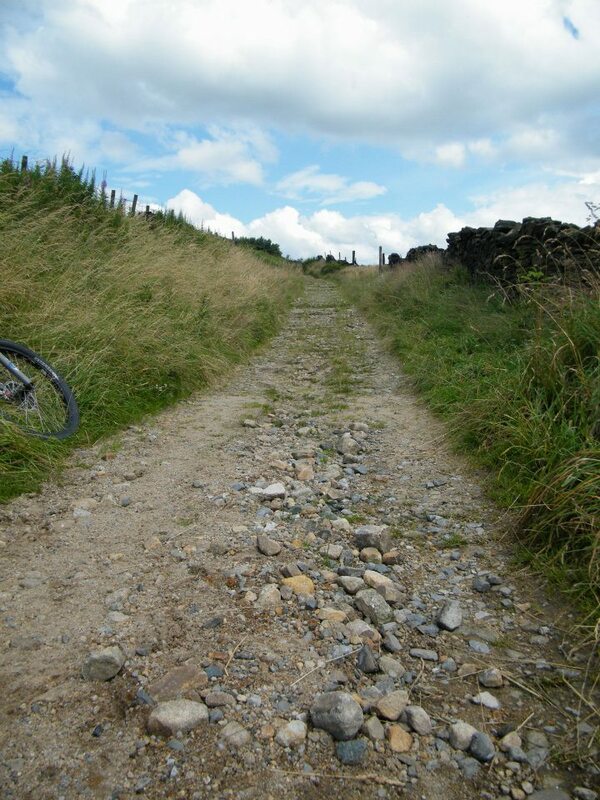 The loop is a mixture of very short tarmac road sections, bridleways, forest tracks, disused packhorse tracks and desolate moorland. This picture simply doesn’t do justice to the incline or the severity of the surface. Take one hand off the bars or one eye off the trail at your own peril. 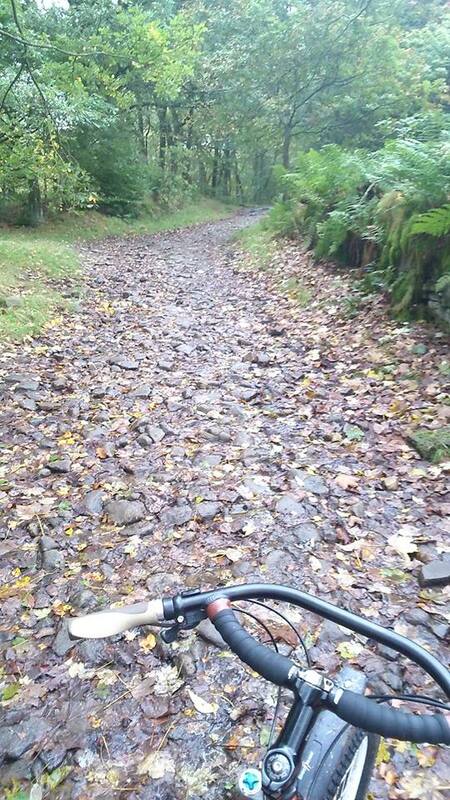 Believe it or not, this trail is actually on the map as a road. It’s got a name and everything. 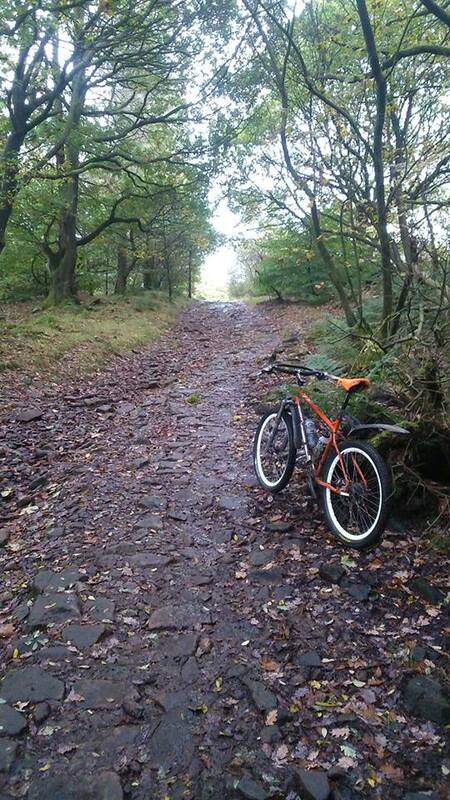 My Maxxis Holy Roller rear tyre was doing a truly spectacular job at finding grip on the loose, wet rocks and even the carpet of rotting leaves didn’t provoke any slippery moments. 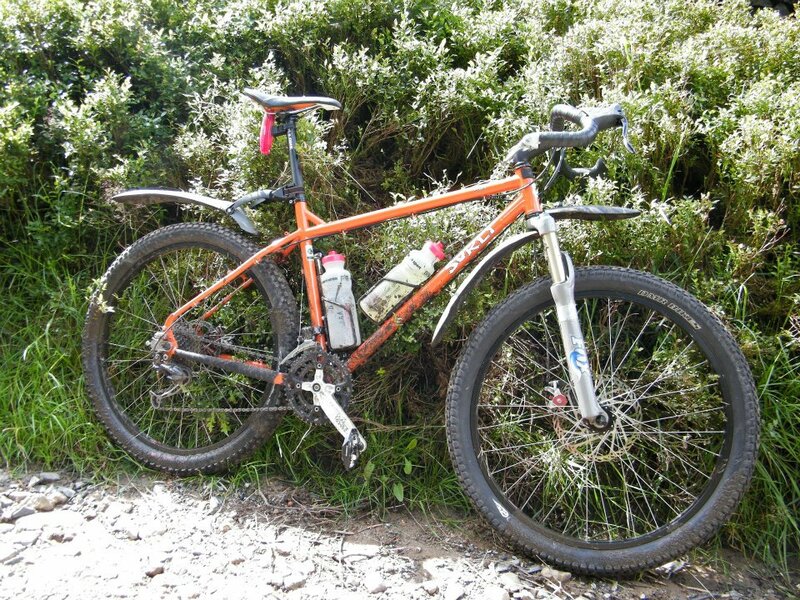 Up front, the DMR Moto RT (both tyres running at 40psi, by the way) was taking the bike exactly where I pointed it with the legendary Fox F100 fork soaking up the relentless impact from the trail. 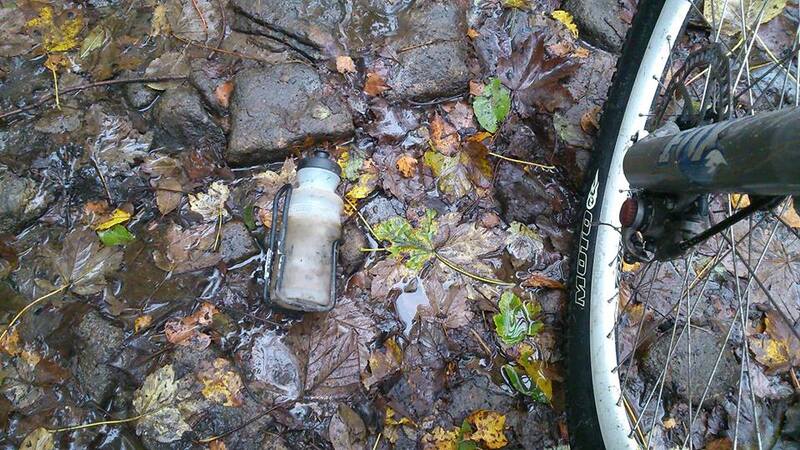 A previous rider had lost his water bottle (and cage!) when the welds finally let go under all the punishment. About half way round the 30 mile route, I made the mistake of stopping on a climb for a nature break and to nom a banana. The incline was so severe and the surface so rough, I really struggled to get back on the bike and start pedalling without losing my balance. Once I did get going again, I shifted my weight all the way forward, grabbing the loop on the front of my Jones Bars which really helped keep the front wheel down as I ground out the remainder of the climb in the lowest gear I could find. 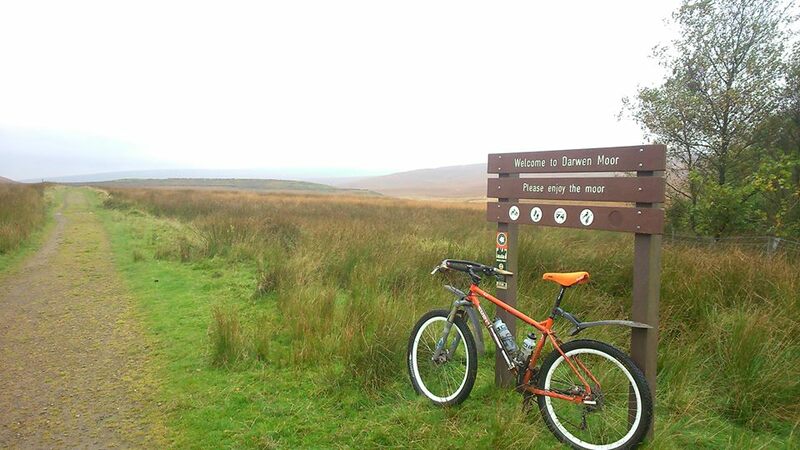 A few slurps of energy drink later and I was rolling onto the beautiful false flat proffered by Darwen Moor. See that big hill hiding behind the sign? Yeah, the car’s over the other side of that somewhere. I hadn’t seen another human being for over an hour and now my only company was the occassional disgruntled looking sheep. As I reached the end of the moor, I had to chase them away to keep them from escaping through the gate with me. Another short tarmac section and I finally met some other humans. Oddly enough, all men. All just kinda hanging around on the trail. All looking a bit shifty. A few heading into the woods. A few giving me the ‘I wasn’t doing anything’ nonchalant look as I rolled by, checking my map. Into civilisation, I rolled. Through a nice little park. Down a wrong turn into a very unfriendly looking farmyard. Quickly back down the lane. Up, up, up. Again the wrong way and this time onto open access land, flagrantly cycling on a pedestrians only footpath. Horizontal rain lashing my face as I crested an obscene climb and played with the traffic. Off in the distance I thought I saw Rivington Pike. “Not far now, keep pushing. Not far now.” I lied to myself out loud. 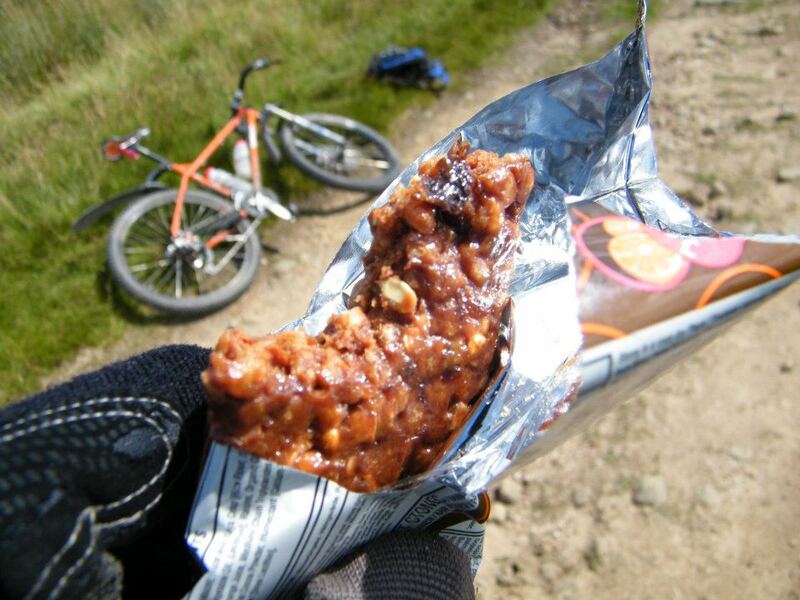 Another huge slurp of energy drink and I hammered onto a bridleway I actually knew. “COME ON! KEEP PUSHING!” I yelled to myself on the final hideous climb. Again, out loud. 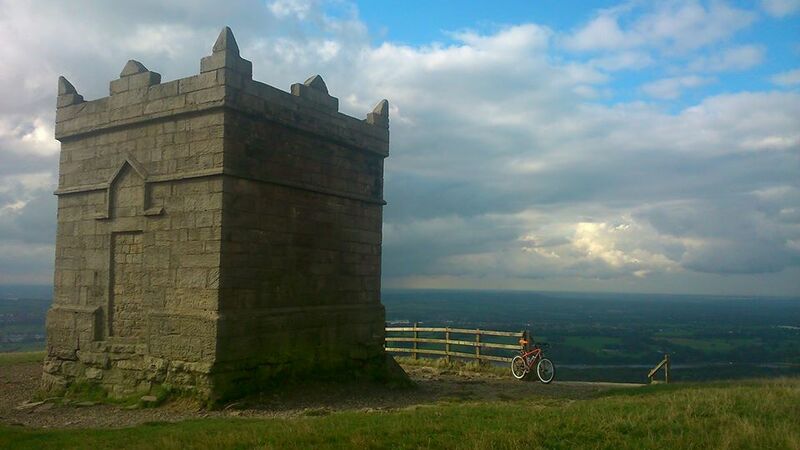 With Rivington Pike at my side, I gazed down at the reservoirs, knowing the car was only a few miles away and all I had to do was survive the descent. Wild-eyed, hepped up on energy drink and malt loaf, I stuck it in the big ring, pointed it down the hill and hooned all the way down. I got out of the saddle, shifted my weight back, threw my arms as wide as they’d go on the bars and just went with it. 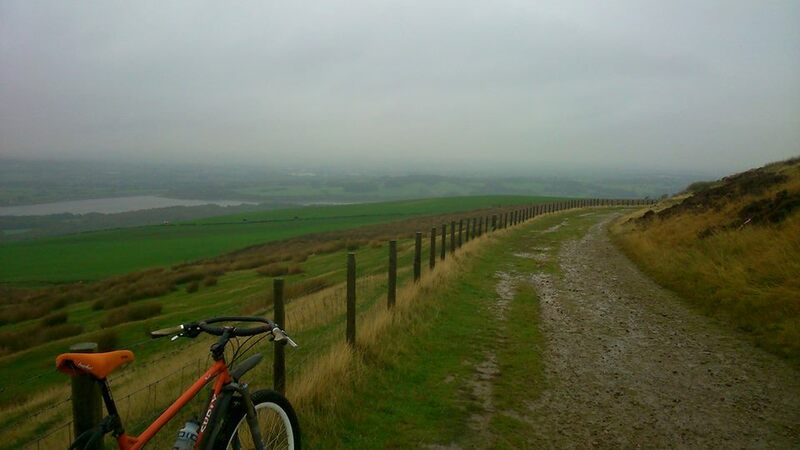 By the time I’d made it to the bottom, the combination of rain, sand and abuse had eaten my rear brake pads, my leg muscles were screaming with lactic acid from keeping hold of the bike and I was filthy. Exhausted, exhilerated and… dammit! I’d parked in the upper car park! Those last few miles were pure agony.